In addition to bringing Thunderbolt to the MacBook Air and to the Mac mini, lightning has struck one of Apple’s other products: its 27-inch display. On Wednesday, the company updated its monitor to bring support for the new high-speed connection, as well as a couple other new features—including a new name: the Apple Thunderbolt Display. Unfortunately, if you’re looking to buy one or upgrade it’s going to cost you some money and some time. The display itself remains largely the same as its predecessor, with a 2560-by-1440 pixel resolution, LED backlighting, in-plane switching (IPS) technology for high viewing angle, an ambient light sensor, and a built-in speaker and microphone. The camera has gotten bumped to FaceTime HD, which allows for high-definition video chats. And the ports on the back of the machine have gotten an upgrade too: In addition to the three powered USB 2.0 ports, there’s also now a FireWire 800 port, a Gigabit Ethernet port, and—of course—a Thunderbolt port. Thanks to Thunderbolt, you’ll only need one cable to take advantage of all those disparate connectivity standards. 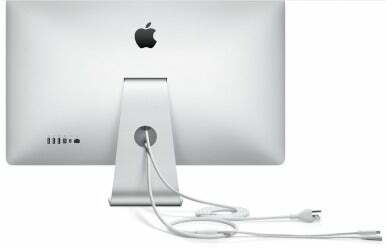 Where previously the Cinema Display had a three-strand cord of MagSafe, Mini DisplayPort, and USB 2.0, the Thunderbolt Display model has only the power connection and a Thunderbolt plug. The new connectivity standard is capable not only of being used as a medium for USB, FireWire, and Ethernet, but also the video connection. And in case one just isn’t enough, you can actually run two Thunderbolt Displays from a single MacBook Pro by plugging the Thunderbolt cable from one display into the Thunderbolt connector on the other. Of course, the new display requires a Thunderbolt-enabled computer—older models won’t be able to use it. Still, as of now, Apple has brought the new protocol to its entire line of Macs, so you have plenty to choose from. 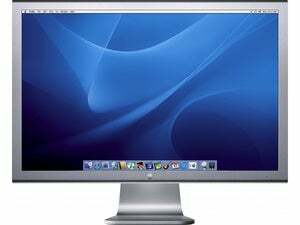 As with the previous iteration of the Cinema Display, the new model costs $999. But though you can place your order on Wednesday, it’ll take some time before it makes its way to you: the online Apple Store currently is reporting ship times of six to eight weeks.